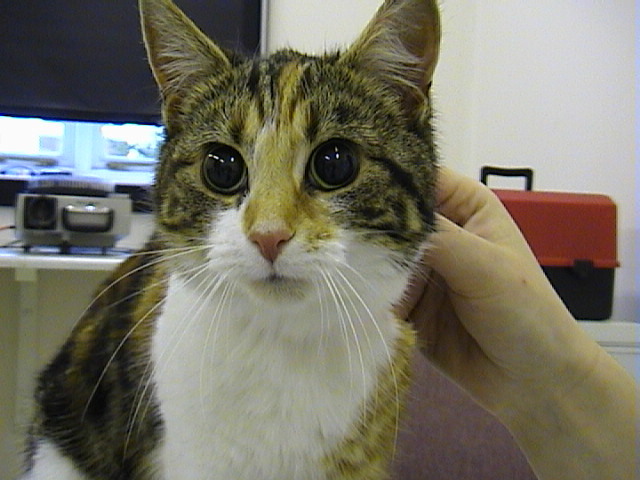 This little 13 year old cat comes to you with widely dilated unresponsive pupils, apparently totally blind. His owner has come back from holiday having left his neighbour to feed the cat, to find her like this. You look in her left eye to see this. What has happened? OK – so maybe this isn’t that difficult a call. 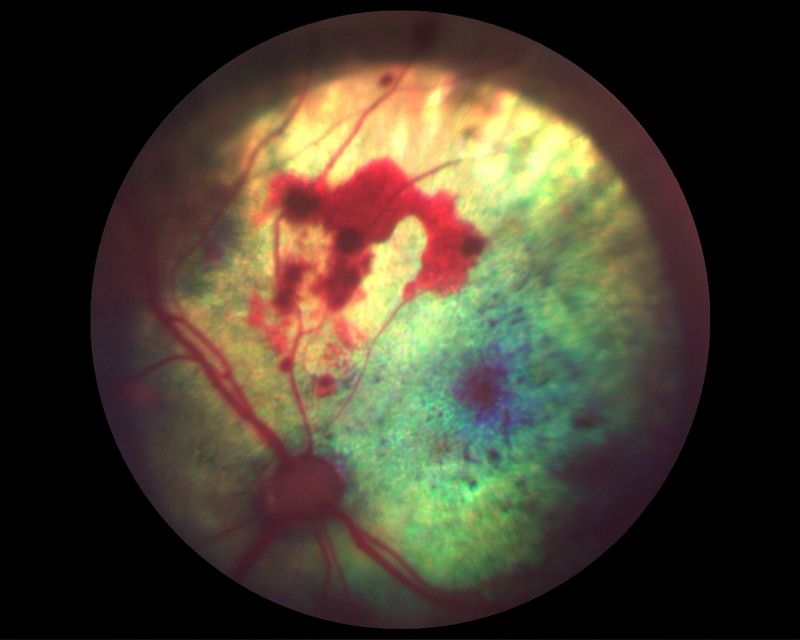 there is retinal haemorrhage suggestive of a hypertensive retinopathy and lo and behold the cat’s blood pressure is 220/180mmHg – it has polydispia and polyuria and small rather knobbly kidneys so probably hypertension secondary to renal failure. Here is the other retina with some tapetal hyper-reflectivity suggestive of a retinal degeneration which might have occurred through a previous detachment, now resolved. The faint radial lines may also support this view of the pathogenesis of the disease. But hold on a second – do these changes really explain the total blindness? It is probably the case that there is flat retinal detachment here with oedema between the retina and the choriocapillaris which provides oxygen and nutrients to the photoreceptors. In all probability the retina is inactive in the first eye through hypoxia and degenerate in the second as the photoreceptors die by apoptosis when starved of oxygen longterm. Amlodipine should reduce the blood pressure and may resolve the blindness, but the long-term changes in the retina may make this less likely. The cat will cope quite well to being blind in all likelihood. 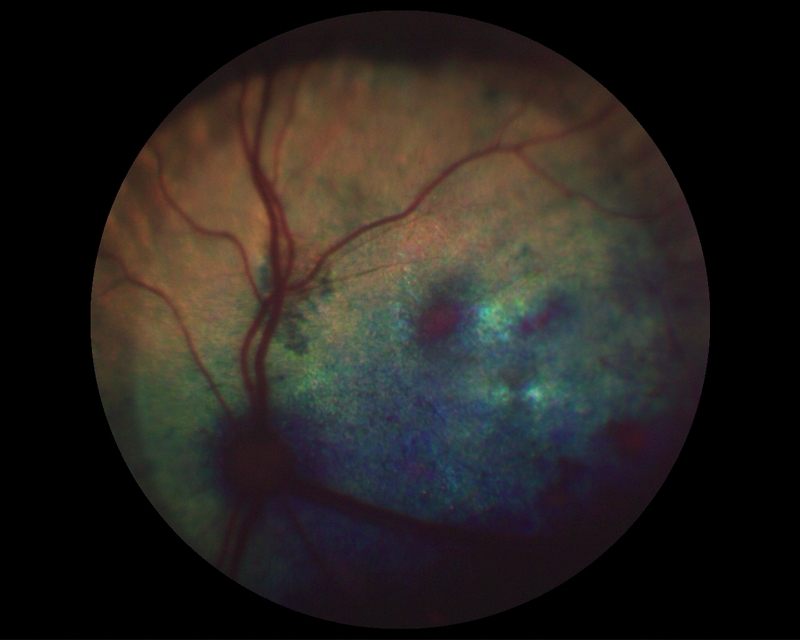 This entry was posted in Cases and tagged hypertensive retinopathy. Bookmark the permalink. One Response to Wide eyed! A while ago I remember you putting a call out to vets for these cases, to see what sort of BP’s were found. I often find cats with some multifocal serous detachment on routine examination and when checking their blood pressures I am disappointed to find them around the 165mmHg mark. This leaves me in a quandry as to whether to treat or not. Of course one needs to consider the other causes of RD but what is your experience? A differential list of one?